"Dwarf Rose" - The most tiny rose in the world. Rose is the flower of love, long time. Now, roses can grow and bloom beautifully in the bottle glass and also grow with your love. 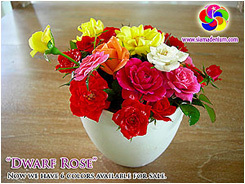 A new gift for today is "Dwarf-Rose" with many colors. Dwarf-Rose is a rose with mini-size. Due to her small size, it's hard to make propagation by budding and root cutting. We have to popularly propagate her by using tissue culture method instead. 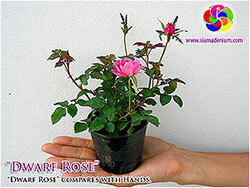 Dwarf-Rose can be made a gift of love, such as valentine or wedding day. We grow her in the bottle or glass tube and also adjust or control her with the same size by pruning. 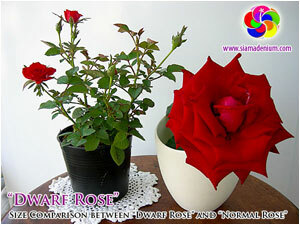 This is needed for all types of roses are already Dwarf-Rose has different features different from normal roses. 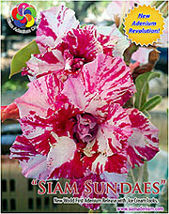 Her stem is not higher than 3-5 inches while the largest flower is not over than thumb. Now we can make Dwarf-Rose up to 15 colors of 15 species which are seen as normal with only red color. 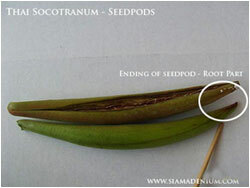 We are using tissue culture in plant propagation. To do this, take the wanted rose from the regular varieties and to cut into small branches. They were embroidered onto agar culture of food in the bottle culture for 12-15 months and put into branches.